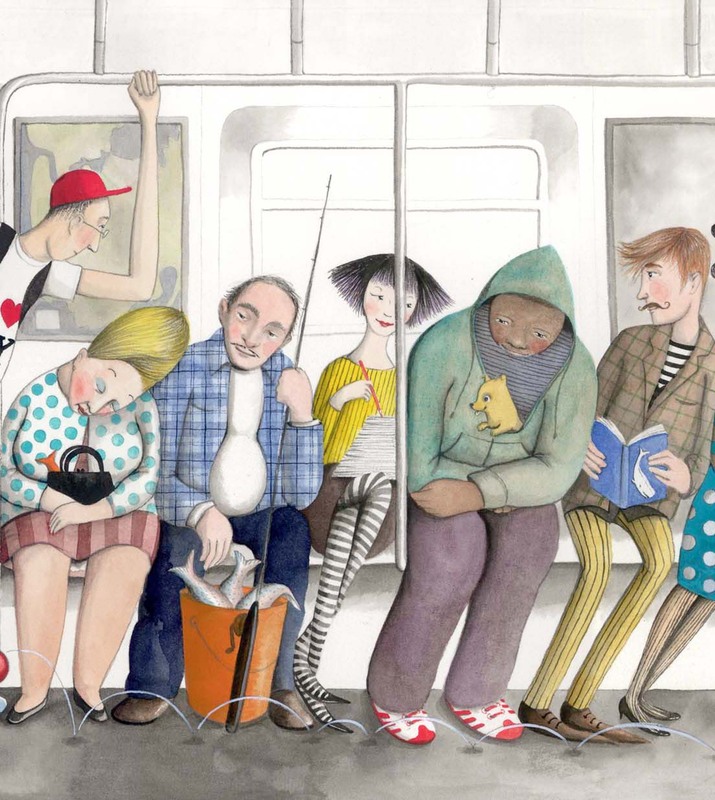 I was thrilled recently to be invited to create a poster for the New York MTA Arts for Transit program. Thrilled is something of an understatement. Every year, two different artists create subway related posters which hang in all the new trains in the city. My friend, the wonderful R. Gregory Christie has designed the other one, so I am in excellent company. Thousands of our posters will be in circulation, so if you are traveling under or over Manhattan, Brooklyn, Queens or the Bronx any time in 2012, you can't miss them. The first one has been spotted on the M train just this morning, other trains to follow. Needless to say I love the subway. I glean all my characters from my fellow passengers. 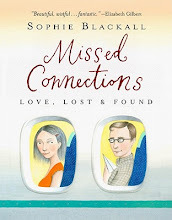 The same sorts of things which attracted me to Missed Connections, I find on the train: subtle interactions, eccentricity, beauty, sorrow, secrets, kindness, generosity, excellent hairdos. Every sort of person imaginable and unimaginable. For this poster, I measured my allotted space very carefully and figured out I had enough space to draw 34 people. I had to whittle and whittle my list of favorite characters. The surfer standing with his board in a puddle of water didn't make it. Neither did the gorgeous elderly drag queen, the man with the enormous orange velour armchair or the disheveled mermaids. I'm sorry. I still love you. I believe the poster will soon be puchase-able online at the MTA store for about $25. Proceeds from the sales go to support the not-for-profit New York Transit Museum’s exhibitions and education programs. I love all these characters! And I found the whale. And there's a poster within the poster! Brilliant poster! Very much makes me wish I was in New York. Congrats! The poster is awesome, I can't wait to stare at it every day looking for new fun details. This is so perfect for the subway! I can't wait to see it on my way somewhere. Congrats! Hope to see it on my next visits to NY. This is so fantastic. I adore your work. I just gifted two of your books to a 2 year old yesterday and offered "Are you awake" to my own 2 yr old son! It struck many cords especially since we co-sleep. Fun book. When this goes on sale, I will find room for it in his room, since he's an avid subway rider and city explorer. It's our favorite part about living in NY. These are cool posters. Especially the last two! I just saw your poster on an N train on the way home. Unfortunately 7 min ride was not enough to study all too familiar characters of the NYC subway. You definitely nailed it. It's just the coolest poster I've seen thus far. 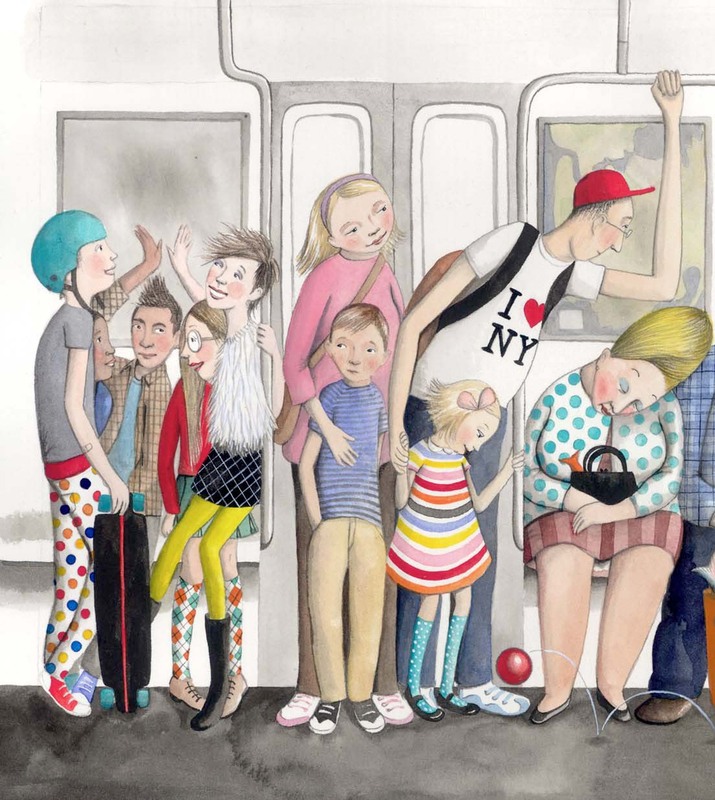 Years ago I met a woman from MTA marketing dept whom just started petty in motion campaign, then followed the art. This is a great way to introduce masses to something so beautiful. I had to come home and look up your name and this poster and show my husband. Thank you! I've been quietly following your blog for months- this is so exciting to read! I'm a daily MTA user myself, I can't wait to see this in person! Congratulations! I was just in NYC...too early! Hopefully I'll be back in time to see it in the subway. wow! wonderful posters. :) I like images like that. This is fantastic - you've totally captured the eclectic mix of everyday folk with all their wee eccentricities and foibles! What a great showcase - I just wish I could go back to New York to tavel the subway and see it in person! hi there, i just wanted to say that seeing your work of art no the subway today really put a smile on my face. i was laughing with my mom about how scary accurate you are especially the Asian lady! that is so awesome! congrats!! i always love looking at those pieces on the train. I saw this last week and I really liked studying all the different characters and how they are related...And then today I came to your blog and saw that you were the artist! congratulations! I boarded my subway train last night – can’t remember if it was the downtown #6 at 86th St. or a downtown N or R at 59th St. – I was exhausted from a grueling amateur chorus recording session – as I glanced wearily up at the side of the train your beautiful MTA Arts For Transit poster caught my eye, mentally refreshed me, and made my evening. 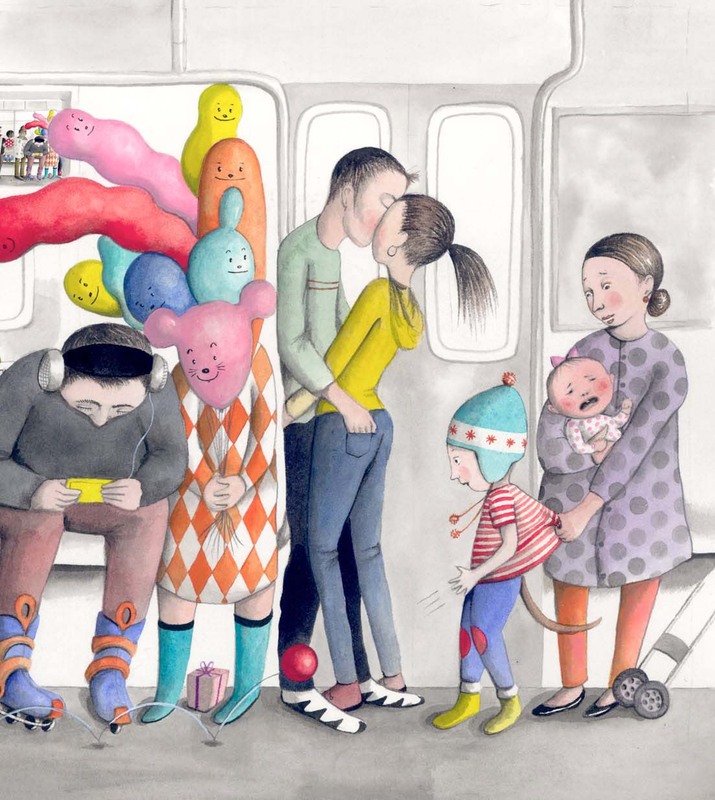 You’re probably too young to have seen the famous “On The Subway” music video from Sesame Street featuring a kaleidoscope of diverse puppets, but your poster reminded me of that wonderful video, and reminded me why my wife and I raised our 3 girls in this city – every kind of person is here, sharing the streets and the subway. Thanks for an unexpected gift of art and beauty on the subway. I am on the Q train right now and I knew it was a Sophie Blackall painting immediately! How brilliant is this??!!! I need to purchase one! Hopefully I can get it at the Missed Connections event this Tuesday at the Transit museum. I loved seeing this on the N line today!!!! I saw this poster on the train yesterday! I was wondering who did it too. Awesome work! OK this just made me miss New York even more than I normally do. Awesome work! Wonderful! I also love that you included a copy of the poster on the poster. Congratulations, Sophie! I saw this on the subway yesterday. I was trying to inch closer to it to look at it more closely but there were people in the way. As I was looking at it, it occurred to me that it looked so familiar! And I realized...that artist from the Missed Connections blog! I first saw your poster on the F train two weeks ago and took a picture of my favorite segment before people started sitting on the bench below it. My friends loved it and we began debating about two of the characters! I saw your poster again this morning and took note of your name and also noticed the poster within the poster... I love it even more now!!! That's exciting news! Congratulations!! 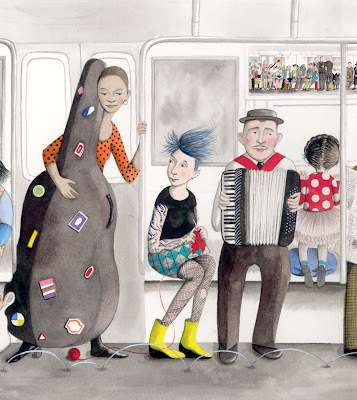 I think that art program is a terrific idea - one that every city that has a subway system should adopt. Hurray for you for having your artwork on display in such a unique and well-traveled area. I'll keep my eye out for your posters whenever I catch a train. Thank you for making my day - the most gorgeous, most beautiful thing I've seen all year, will see all year, possibly. Thank you. I just found your website and heard about the book, and I instantly went on Amazon to order it. I can't wait to finally get it. I live in Toronto and honestly, I'd love to see such an inspiring poster in our subways..
Wow! Just landed on your blog, and, amazing pictures! Wow, I love it. Will come back to read more. This is marvelous! I often feel like there is the (missed) potential for so many connections on public transit. That is amazing! What a wonderful talent you have!!! This missed connection is more and more popular all over the world not only the Nyew York. I also often feel like there is the (missed) potential for so many connections on public transit. I love your artwork - must find the book. I think so many of us try to imagine the lives of others while sitting on a train or bus. Paris' subway is the same ... So hard to enjoy the subway ! I am on the q train right now looking at this piece. When i saw it i just had to google the artist. I love this illustration. Great work ! You're absolutely one talented person with exceptional style in deliver a good story through your art! I'm a big fan! Je ne comprends pas l'anglais mais je comprends très bien vos dessins! Ils sont tendres. Charming. Real life experience is not as charming as your work. Mine is about fashion ( I promote spanish designers in Qatar), style and my experience as an expat western woman in this muslim conservative country ! Would you like to follow each other? I saw your poster last week, and was drawn to it immediately! It is a great study of character, and both humorous and based on reality. And the poster image within the poster made it even more fun! I'm glad to see it will be for sale, because when I first saw it I thought it was a great slice of NYC to go in an apt. This is really cool :) I like all the diversity put into the picture. Interesting blog. I love your art. That is very cool to have your poster selected for NY train! 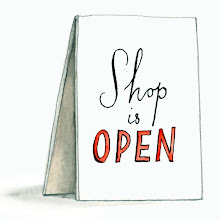 As an editor for 2 fashion magazines, I am always trying to promote illustration. You did an amazing job here. This picture made me SOOOOOO happy! I studied it for about an hour as I rode the Q back from far-off Brooklyn, and every detail is so on-the-mark! I love the squished woman's expression, I LOVE the bear! The tired mothers and the communicaion among all the people, it's like a kind of transcendent family. Thank you for brightening my subway ride. Oh, the Chinese woman with weird plants! That's hilarious! 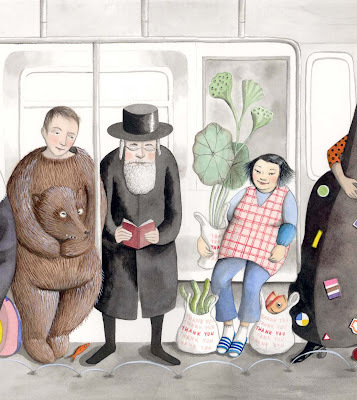 And the kissing hipster couple's body language, so clearly communicating self-absorption and dieting-for-pants, and the Chasid next to the bear, and the littler poster up on the wall, I kept finding more and more every minute and felt as if I were really riding my subway, as if I owned the space myself along with others. I want more! Oh, the way the tattooed poet is the only one who's got her eye on the ball...it's so fabulous! it's a little novel...the high school kids' hair! Best subway ride ever! I just discovered your blog and am already in love. This poster is beautiful. Congrats! I saw your art on the subway last weekend! I love this piece so much, it makes me happy. Really beautiful poster that I spotted today. The layers of subtle elements are amazing, and I stared at it for the entirety of my ride, discovering more and more as I looked. 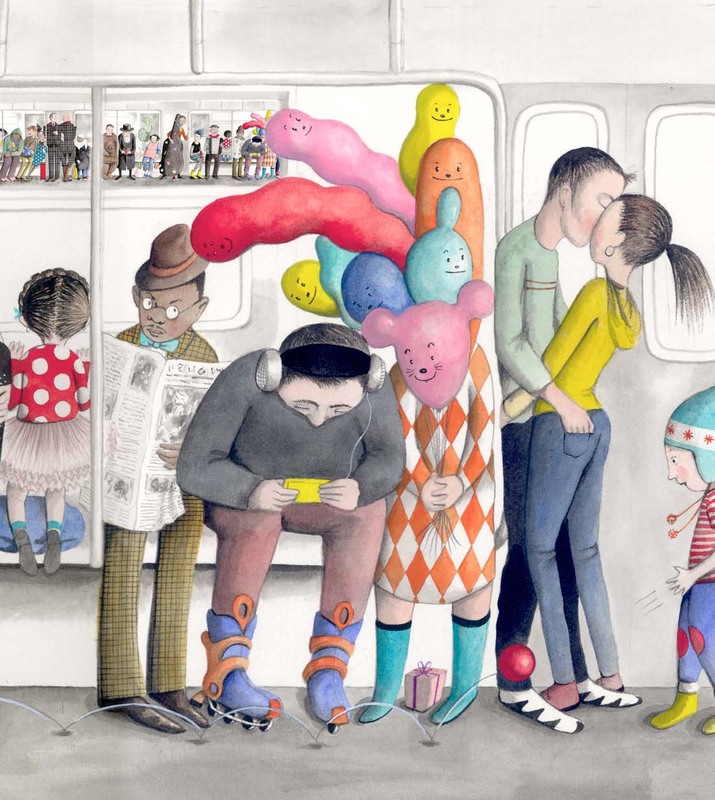 Anyways: no ad, posted, or other illustration I've ever seen in the subway has inspired me to look up the artist and pay them a complement. I wanted to do so for you though. Congrats on this, and keep it up! I always enjoy this poster when I ride the train (I identify most with the tattooed girl knitting) but recently I gained a whole new appreciation for this work. 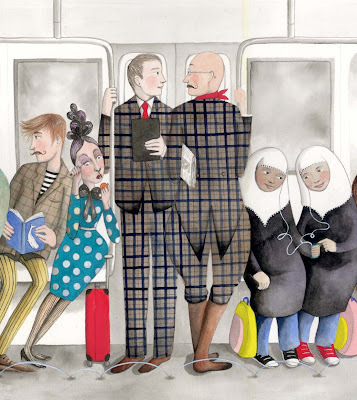 I rode the subway yesterday with a large group of girls, probably aged 9-12, on a trip with their Muslim school. Each one of them was wearing the same uniform of a white head scarf with a long black top. Many of them also wore blue jeans and sneakers. They were all enjoying joking and laughing with one another. Suddenly one of them looked up and proclaimed, "They look like us!" The girl sitting next to her said "They DO look like us!" The few other girls sitting nearby looked up as well and they all stared for a moment smiling. When I looked up as well I saw that they were looking at your picture. The two Muslim girls in this poster look like these girls not only in the way they were dressed, but in their expressions and body language as well. It was as if you had painted two of these exact children on the spot. The looks on the children's faces showed a deep appreciation for finding themselves so beautifully represented. I don't know what it is like to grow up as a Muslim girl in NYC, but I do remember being in their age group and wanting to know that I belonged to the world. Seeing something that looked like me meant (and still means) a lot. This poster told those girls that they belong exactly where they are doing exactly what they do. Awesome.... It is how, I discovered your work. Do you guys have a facebook fan webpage? I searched for one on facebook or myspace but couldnt find cheap Burberry Handbags, Id love to become a fan! I am interested in http://www.christian-louboutin-saleonline.com very much, so I concern on christian-louboutin-saleonline, well, Christian louboutin, cheap christian louboutin for sale, 70% off also sounds good. Can there be any more stereotyping? Its obvious which race you did not want to offend and which ones you did. This is not artistry. This is bigotry. Echt super. Wir freuen uns immer wieder über Ihre interessanten & neuen Beiträge. Viele Grüße. Danke für diesen tollen Beitrag der super gelungen ist. Freue mich immer wieder über die genialen Beiträge die von euch veröffentlich werden. Weiter so.